The Ugly Duchess (also known as A Grotesque Old Woman) is a satirical portrait painted by the Flemish artist Quentin Matsys around 1513. 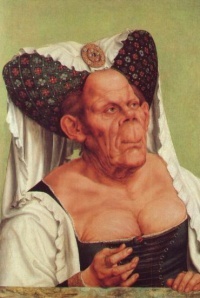 It shows a grotesque old woman with wrinkled skin and withered breasts (partially visible from her low-cut dress). She wears the aristocratic horned headdress of her youth, by then out of fashion, and holds a red flower in her right hand, at the time a symbol of engagement, indicating that she is trying to attract a suitor. However, it has been described as a bud that will 'likely never blossom'. The work is Matsys' best-known painting. Secular and moralizing, The Ugly Duchess is likely drawn from two sources. It bears striking resemblance to the Grotesque Head head drawing commonly attributed to Leonardo da Vinci. 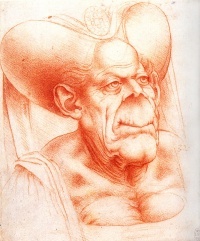 The caricatures were originally believed to be based on an earlier lost work by Leonardo, but are now believed to be based on the painting of Matsys, who is known to have exchanged drawings with Leonardo. The second source is Erasmus's essay In Praise of Folly (1511), which satirizes women who "still play the coquette", "cannot tear themselves away from their mirrors" and "do not hesitate to exhibit their repulsive withered breasts". however, she had died 150 years earlier. In 2008 it was proposed that the sitter suffered from a rare form of Paget's disease, in which the victim's bones enlarge and become deformed. It hangs in the National Gallery in London, to whom it was bequeathed by Jenny Louisa Roberta Blaker in 1947. It was originally half of a diptych, with a Portrait of an Old Man, in the Musée Jacquemart-André, Paris, which was lent to the gallery in 2008 for an exhibition. The two paintings were hung side by side. The portrait is considered to be the inspiration for John Tenniel's 1869 illustrations of the Duchess in Alice's Adventures in Wonderland. Grotesque Head by da Vinci. Unless indicated otherwise, the text in this article is either based on Wikipedia article "The Ugly Duchess" or another language Wikipedia page thereof used under the terms of the GNU Free Documentation License; or on original research by Jahsonic and friends. See Art and Popular Culture's copyright notice. This page was last modified 17:08, 23 November 2014.